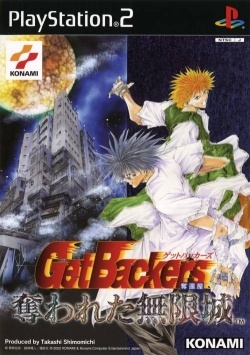 Game description: GetBackers Dakkanya: Ubawareta Mugenjou is an action RPG based on the Manga series GetBackers. You control two characters, Ben and Ginji, who possess special powers that allow them to find and to recover items, valuables, and even people who got lost. Now they are offered a huge sum of money for a recovery job they have to do for a mysterious customer from an even more mysterious Castle of Infinity. The gameplay is based on exploration of randomly generated dungeons. You search for items and also trigger important cut scenes by exploring every corner in the dungeons. The action-based combat resembles a fighting game. You can perform a variety of moves, block your opponent's attack, and switch between the characters. Attacks deplete your stamina bar, so continuously using the strongest attacks is not always the best choice. When your stamina bar is full, you can perform powerful combo attacks. This page was last edited on 15 April 2019, at 15:31.